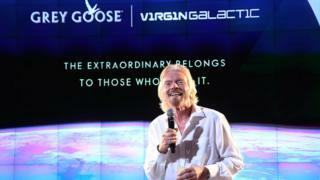 Entrepreneur Sir Richard Branson has said that Virgin Galactic is "weeks" away from its first trip into space. "We should be in space within weeks, not months. And then we will be in space with myself in months and not years," the firm's founder and chief executive told news website CNBC. He said the firm would be taking people into space "not too long after" that. He founded the commercial spaceflight company in 2004. The company first promised sub-orbital spaceflight trips for tourists by the start of 2009. But delays and a fatal crash in 2014 prevented Sir Richard's original ambitions. Earlier this year, Virgin Galactic completed a supersonic test flight of its SpaceShipTwo passenger rocket ship, its first since the crash. The 67-year-old multi-millionaire was initially expected to take part in a space flight before April this year. In an interview with BBC Radio 4's You and Yours programme, Sir Richard said he was receiving astronaut, centrifuge and fitness training. "If I have a room full of 10 people, eight out of 10 would love to go to space if they could afford it," Sir Richard told CNBC. "It is up to us to produce as many spaceships as we can to cater with that demand." His announcement comes shortly after rival SpaceX unveiled the first private passenger it plans to fly around the Moon. Amazon founder Jeff Bezos has said his space travel firm Blue Origin will launch a manned mission into space by 2019. Mr Bezos didn't clarify if he meant crew or fare-paying passengers. Earlier this month, Blue Origin also announced that it is launching a non-profit group with Airbus, the European Space Agency, Agencia Espacial Mexicana, and French construction company Vinci Construction to explore ways to colonise the moon.